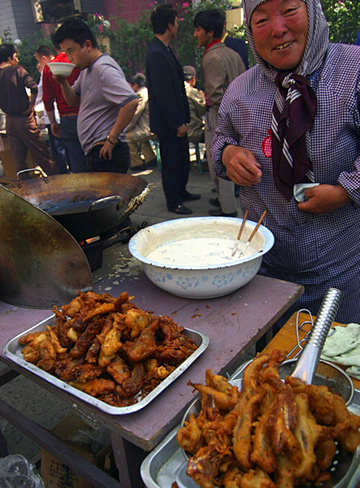 Many of the vendors from Xinjiang had carts selling homemade nan. The plain naan are shaped like stars. The salty naan are big disks. 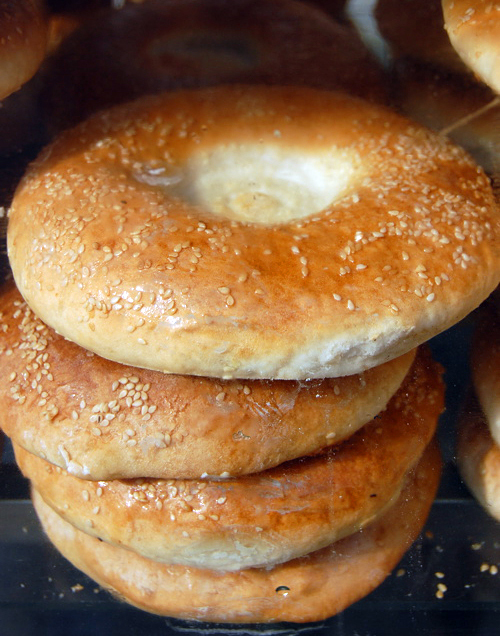 The sweet naan look like New York bagels but taste more like hard rolls, with none of the pillowy density. Since most of vendors are Uighurs from Xinjiang province, I had previously thought their "girdeh naan" had Islamic Turkic origins. 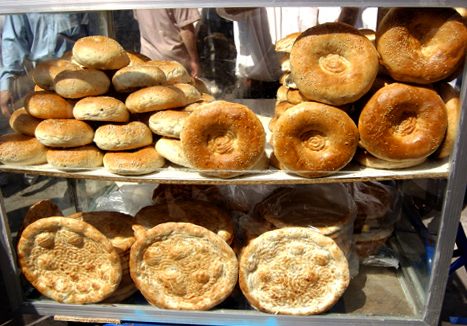 But maybe there's also some Jewish influence into Xinjiang, and subsequently their bagel-naan. One things for sure: you won't find any poppy seed bagels. Some food selections: dinner-roll-sized dumplings for 2 yuan each, langman (spicy cold noodles), lamb skewers, lamb broth, lamb shoulder in big chunks. If you smile sweetly the vendor may give you a piece to try. After some dumplings and lamb samples, what you'll crave most is a cold drink. There's no soda or lemonade, but doogh sellers will gladly make you an iced yogurt drink on request. They chip off ice from a big block into a styrofoam bowl, add homemade yogurt, and mix in honey. It tastes like thinned out lassi, which is perfect if you're so thirsty you gulp down the bowl. Aside from the dumplings and yogurt drink, the quality of the food is also debatable. A bowl of Xinjiang pulao, rice with carrots and onions and topped with braised lamb, was cold and pretty bland. The Egyptian and Uighur Ph.D students I met had the same sentiments about their food, but added there were few other halal choices in Shanghai. Despite having less than spectacular food variety, the atmosphere still makes it my top pick for street food in Shanghai. The other tourist board-designated snack streets in Shanghai and Beijing can't compare. The closest subway stop is Zhenping Lu. From there, walk south 15 to 20 minutes.